SHEDDER REFUGEE CAMP, Ethiopia - The Somali woman lives in a stick hut covered by ragged blankets in this dusty refugee camp. It was here that her 15-year-old son wanted to travel on a perilous journey as a stowaway on a plane from California. Ubah Mohammed Abdule hasn't seen her boy - who was hospitalized in Hawaii after landing there last week in the wheel well of a jetliner - for eight long years. Clutching her black-and-white head covering, she wept Sunday as she stood before the flimsy shelter holding her meager possessions and spoke about her son, Yahya Abdi. She was alarmed, she said, by the dangerous journey the teenager undertook. Those who stow away in wheel wells of airplanes have little chance of surviving, and many who attempt it are Africans desperate for a better life in Europe or America. 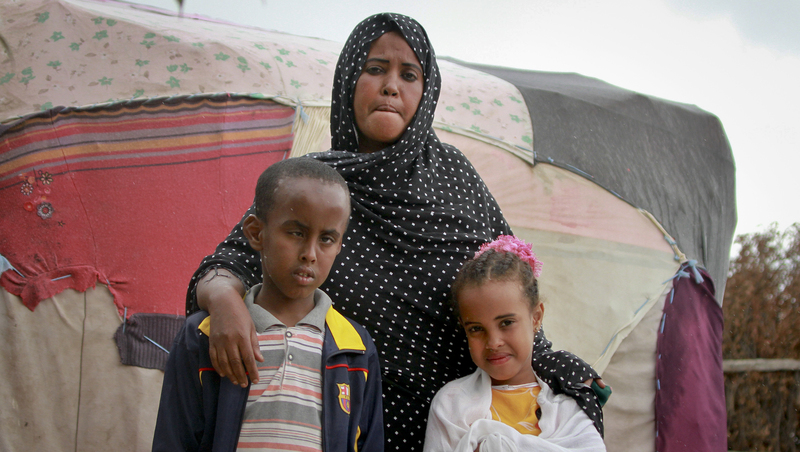 Abdi had been unhappy in California and desperately missed his mother, according to those who know his family. So on April 20, he hopped a fence at San Jose International Airport and climbed into the wheel well of a jetliner. It was bound for Hawaii, the opposite direction of Ethiopia. Somehow he survived the 5 1/2-hour trip over the Pacific, despite extreme cold and low oxygen levels. He has not spoken publicly about the ordeal. "I knew he was an intelligent boy who has strong affections for me. I also knew he always wanted to see me, but I know his father won't let them contact me at all," Abdule told an Associated Press reporter in this remote camp in eastern Ethiopia. The boy had recently learned she was alive after being told by his father that she was dead, Abdule said. She said her ex-husband took Abdi and his two siblings to California without her knowledge and that she hadn't heard from them since 2006. "He first took the children away from me to Sudan. Then he came back to Somalia and demanded my consent for him to take the children to the U.S. if I wanted a formal divorce. I was not OK with that and said no," Abdule said through tears. "Finally, he took all three of my children to the U.S. without my knowledge." The boy's father Abdilahi Yusuf, said in a statement Sunday issued through a family spokesman in California that his son was "struggling adjusting to life" in America. "Our situation was aggravated by our displacement in Africa for many years after fleeing our home country of Somalia because of war conditions. As a result, my son was not able to receive any formal education before we immigrated to the United States," the statement said. Shedder Refugee Camp, in far eastern Ethiopia near the border with Somalia, is home to some 10,300 Somalis who fled their country because of Islamic militant violence. Most Somalis here are from minority groups who face persecution. Abdule, 33, arrived in the camp in early 2010, after fleeing heavy fighting in the Somali capital, Mogadishu. She earns a small income selling vegetables in the camp market. The Ethiopian government's refugee office provided the distraught mother with psychological support after she heard about her son's story from a friend who lives in the U.S., said Kibebew Abera, a camp official. "She was panicked. With the support of our partners, we provided her with advice and consultation," he said. Tears rolling down her cheeks, Abdule said she wants to leave the camp and reunite with her children and has asked the Ethiopian government and the U.N. refugee agency to help her do so. "My son was silent but intelligent when he was with me. I know he concealed himself in a plane to see me," Abdule said. The teen's father said he plans to fly to Hawaii soon to reunite with him and is "excited to bring him back home to his family in California." The family was "deeply concerned" when the boy went missing and was relieved to hear he was safe, Yusuf said. Abdule said she hasn't been able to eat since learning of her son's misadventure. She said she has visions of her ex-husband not properly caring for their children. "I prefer they be with me than live with a stepmother in the U.S.," said Abdule, who has two other children, an 8-year-old son and 5-year-old daughter, living with her in the camp. Abdule may yet be able to reunite with her children in the U.S., U.N. officials said. She has passed her first interview with the U.N. refugee agency's list of those who might qualify to immigrate to America, said a legal protection officer at the refugee camp, Abdlrasak Abas Omar. If she passes the next phase, he said, she could move to the U.S. in less than a year.